Keep your mind active. Mentally stimulating activities, such as puzzles and word games, and memory training may delay the onset of dementia and help decrease its effects. Be physically and socially active. 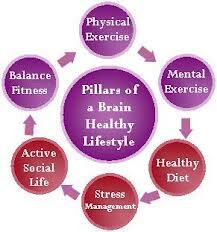 Physical activity and social interaction may delay the onset of dementia and reduce its symptoms. Quit smoking. Some studies have shown smoking in middle age and older may increase your risk of dementia and blood vessel (vascular) conditions. Quitting smoking may reduce your risk. Lower your blood pressure. High blood pressure may lead to a higher risk of some types of dementia. More research is needed to determine whether treating high blood pressure may reduce the risk of dementia. Pursue education. People who have spent more time in formal education appear to have a lower incidence of mental decline, even when they have brain abnormalities. Researchers believe that education may help your brain develop a strong nerve cell network that compensates for nerve cell damage caused by Alzheimer’s disease. Maintain a healthy diet. Eating a healthy diet is important for many reasons, but a diet rich in fruits, vegetables and omega-3 fatty acids, commonly found in certain fish and nuts, may promote overall health and lower your risk of developing dementia. ← I recently heard about a new Alzheimer’s treatment, a nose spray containing insulin. How does it work and is there an Alzheimer’s nose spray available?